African rhinos and African oxpeckers share a symbiotic relationship that was once confidently described as mutualistic, but recent research indicates that the relationship is more complex. The two animals are not entirely equal partners, with the relationship tipped in favor of the bird. Among the several forms of symbiosis is mutualism, in which two or more organisms live or function together to benefit each other. One aspect of mutualism is the extent of involvement -- one partner may be completely dependent on the relationship (obligate), while the other benefits from the relationship but can survive without it (facultative). Adding the word "cleaning" to mutualism indicates that one partner removes external parasites from the other. 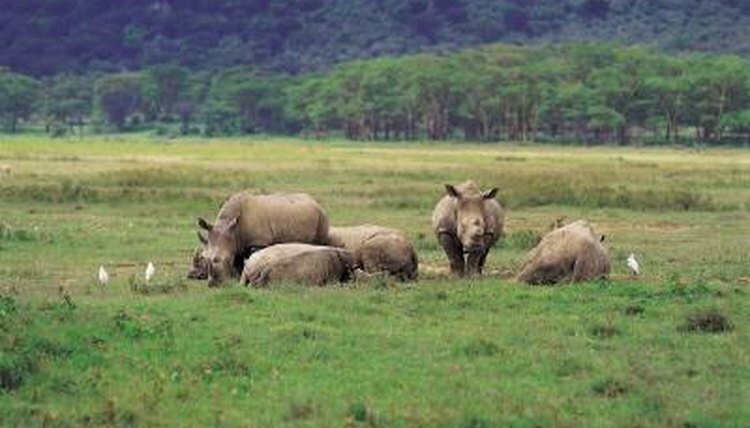 The rhino ("kifaru" in Swahili) grazes on the African savanna and shelters in dense thickets of thorny brush. Ticks lurk in both spots, waiting to fling themselves onto a host. Kifaru's skin is thick, but very sensitive and well supplied with blood just under the surface, so it bleeds easily. Ticks and other skin parasites make Kifaru itch horribly, so he spends a lot of time and energy scratching himself on rocks and trees, trying to get rid of them. This is where the oxpecker, or tickbird, can be a big help. Kifaru is also very shortsighted and has a hard time seeing enemies if they approach, but the oxpecker on Kifaru's back can, and provides some warning by hissing and screaming. Because the rhino can survive without the tickbird, Kifaru is a facultative partner in this mutualistic relationship. The little oxpecker ("askari wa kifaru" or "the rhino's guard" in Swahili) "cleans" the rhino by plucking ticks from Kifaru's skin, but does so selectively; he prefers big, fat ticks that are already engorged with blood, ignoring the little ones that irritate Kifaru just as badly. The oxpecker also searches any wounds or sores Kifaru may have and removes botfly larvae and other parasites, but in the process he also removes scabs and tissue, causing fresh bleeding. In fact, the oxpecker gets his blood meals as much directly from Kifaru himself as from the parasites he removes. This makes the tickbird the obligate partner, almost a parasite himself. He needs Kifaru with his parasite burden as a primary, if not a sole, food source. The oxpecker is not the only partner Kifaru has in mutualism. White birds larger that the tickbird follow the rhino, feeding on insects and small animals Kifaru disturbs as he passes. They sometimes even ride on his back. These are cattle egrets (Bubulcus ibis), and like the tickbird, they follow many large mammals to profit from their passage. This places the cattle egret in a different category of mutualism with the rhino, called commensalism. This is a more balanced relationship, as both partners benefit and neither takes more than he gives. The cattle egret gets food delivered to him and Kifaru gets the same warning when the cattle egrets take to the air and sound an alarm call if a predator approaches.